Home » Health » What Is Pulmonary Edema? Pulmonary Edema is a condition characterized by symptoms of difficulity breathing due to the accumulation of fluid in the lungs ( alveoli ). This condition can occur suddenly or develop for a long time. Under normal conditions, air will enter the lungs when breathing. However, in conditions of pulmonary edema, the lungs are filled with fluid. So that inhaled oxygen is not able to enter the lungs and blood flow. In the case of chronic pulmonary edema that is long-term, patients will feel tired faster which is characterized by more often feeling tight compared to usual. Shortness of breath will be felt more when the patient is doing physical activity and lying down. Symptoms of chronic pulmonary edema can also be accompanied by a distinctive clogged breath when exhaling (wheezing), waking at night during sleep, rapid weight gain, swelling in both legs. The second type of pulmonary edema is acute pulmonary edema that is fast. In this condition, symptoms of shortness of breath attack suddenly to cause the sufferer as if feeling suffocated or drowned. They will look anxious or scared with their mouth gasping for trying to get oxygen. In addition, patients will experience palpitations or an increase in heart rate quickly and irregularly accompanied by a foamy cough with phlegm and mixed with blood. If this acute pulmonary edema occurs due to heart disease, then the symptoms of chest pain can also be felt. There are several types of causes of pulmonary edema, usually associated with heart problems. However, pulmonary edema can also occur without heart problems. It is at an altitude (above 2,400 meters above sea level). Head injuries , seizures, or after brain surgery. Inhale smoke during a fire. Exposure to ammonia and chlorine toxins, which may occur during a train accident. Pulse oximetry, to quickly measure oxygen levels in the blood, by placing sensors on the fingers or toes. Electrocardiography (ECG) , to see signs of a heart attack and problems with the heart rhythm. 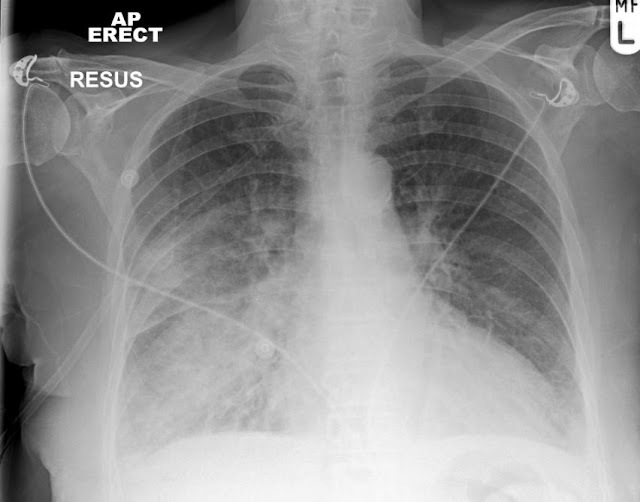 Photograph of chest ontgen, to ensure that the patient actually has pulmonary edema, and see other possible causes of shortness of breath. Blood tests, to measure oxygen and carbon dioxide levels in the blood (blood gas analysis), measure increased levels of B-type natriureti c peptide (BNP) in heart failure , and see thyroid and kidney function. Echocardiography , to find out if there is a problem with the heart muscle. Cardiac catheterization, is performed if pulmonary edema is accompanied by chest pain, but no abnormalities on the ECG or echocardiography are found. Pulmonary artery catheterization, to measure the pressure in the pulmonary arteries. This examination is done if other tests are not able to confirm the cause of pulmonary edema. If you see someone experiencing an acute pulmonary edema with symptoms such as dizziness, shortness of breath that occurs suddenly, gasping for breath with wheezing, cough with phlegm frothed or mixed with blood, looks tired, the skin becomes blue, and sweats a lot due to decreased blood pressure, immediately take it to the hospital or call an ambulance. Acute pulmonary edema that is not immediately treated has the potential to result in death. As the first treatment of pulmonary edema, the doctor will give patients with oxygen. After that, to reduce the pressure on the blood vessels, both before entering the lungs and heart, or afterwards. The drugs given are diuretics such as furosemide and nitrate drugs such as nitroglycerin . Diuretics work by removing more fluids, while nitrates work by dilating blood vessels. Both of these can reduce the pressure in the blood vessels. Pulmonary edema is often accompanied by a rise in blood pressure or even lower blood pressure, a drug to make optimal blood pressure will be given, either lowering or raising. If needed, the patient will be placed in a hose to connect to the breathing apparatus, to ensure that the oxygen entering the body is sufficient. Exercise as much as 30 minutes every day. Eating healthy foods in the form of vegetables, fruits, and foods low in fat, sugar, and salt. It aims to maintain your weight, cholesterol levels in your blood, and your blood pressure is always within normal limits. Don't smoke and avoid stress. Pulmonary edema that is not handled or continues can cause an increase in pressure in the right heart chamber, which receives blood from the entire body. This condition causes the right heart space to fail and there is a buildup of fluid in the abdominal cavity (ascites), swelling of the legs, and swelling of the liver. 0 Response to "What Is Pulmonary Edema?"